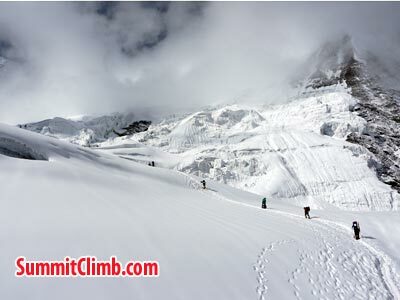 Our Entire Team Just Summited Manaslu. 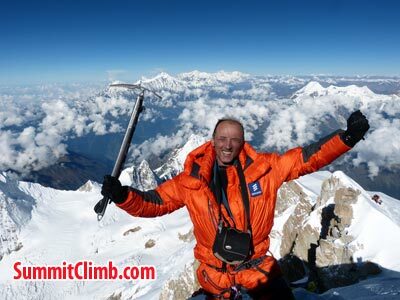 Congratulations to Everyone who climbed and a big thank you to all of the family, friends, colleagues, and sponsors who supported them. 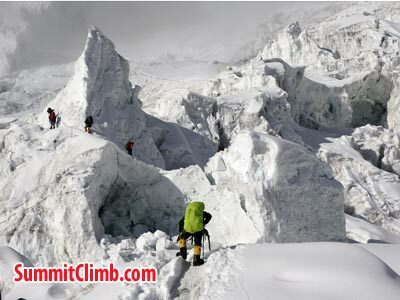 We look forward to seeing you on next year's ManasluClimb.com and also for Cho Oyu, Lhotse, Everest Tibet, Everest Nepal, K2, Broad Peak, Gasherbrum 1, and Gasherbrum 2. 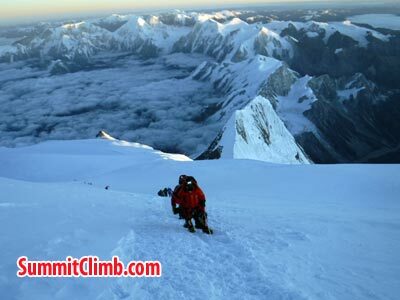 World's eighth highest & most accessible 8000 metre/26,200 foot peak in Nepal. 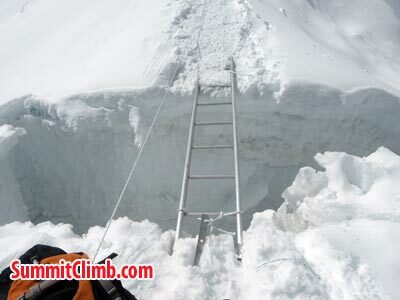 High altitude "easy" snow climb. Dates and cost: 28 August to 4 Oct, 2018. 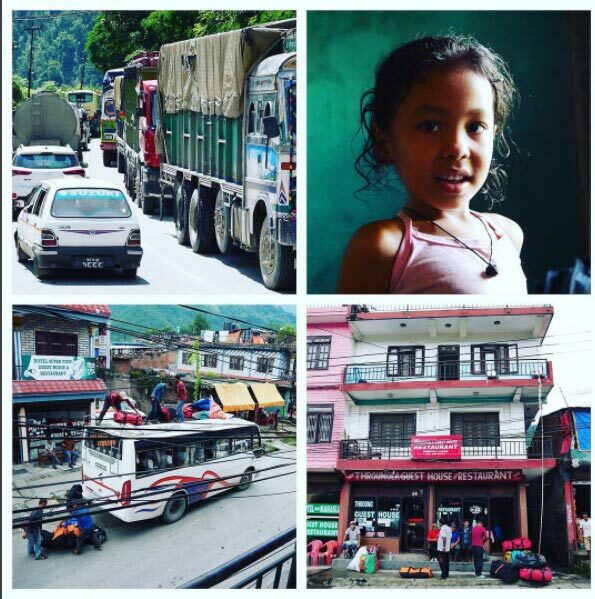 38 days in Nepal. 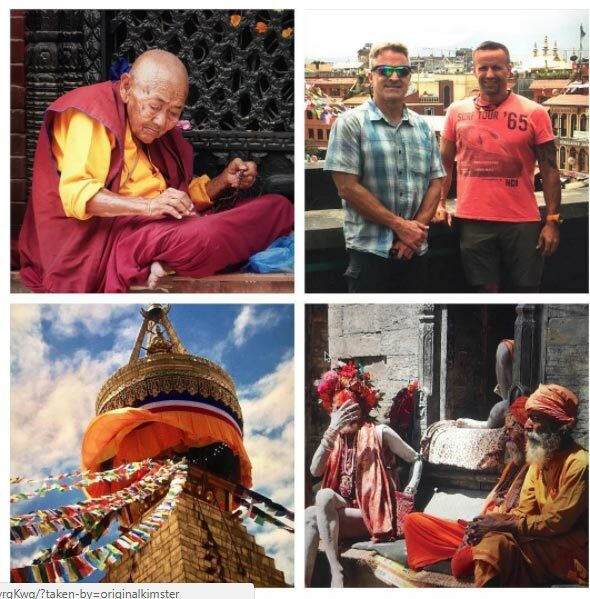 Full service includes: Sherpas, hotels, trek to basecamp (bc), ropes, good food on trek, in bc, & climb, group climbing equipment, tents, radios, satphones, etcetera. 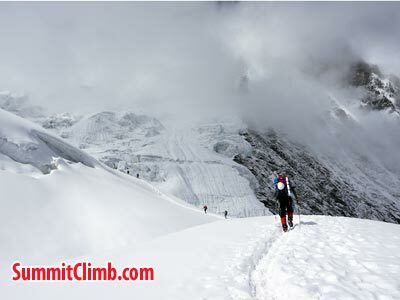 Climbing Manaslu qualifies you for Everest from Tibet, Everest from Nepal or Lhotse . 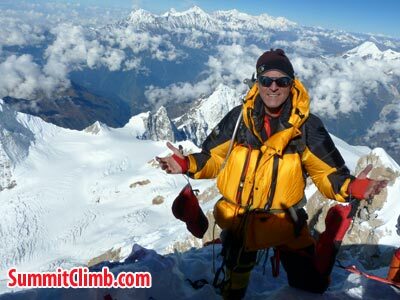 Kim at the summit of Manaslu. 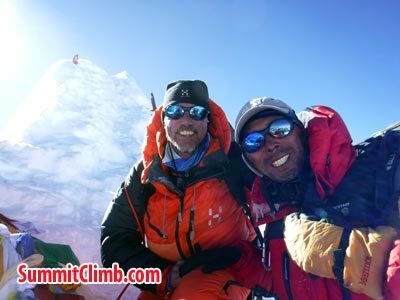 Photo Kim N. Magnus and Tenji at the summit of Manaslu. 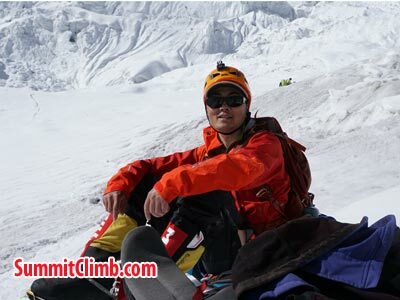 Photo Mangnus N.
Puwei L. at the summit of Manaslu. 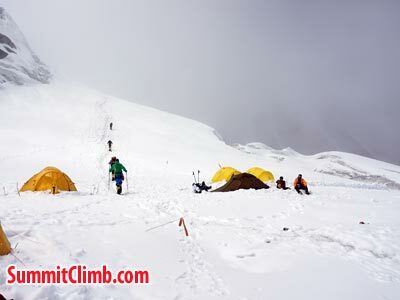 Climbers heading for summit from Camp 4. 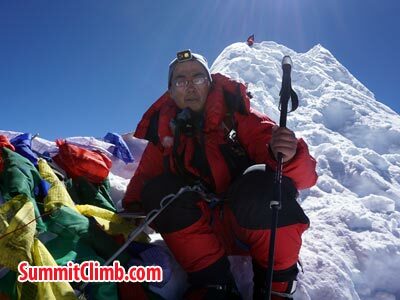 Photo Puwei L.
Being ready at Camp 3. Photo Puwei L. Bit of Ice fall. 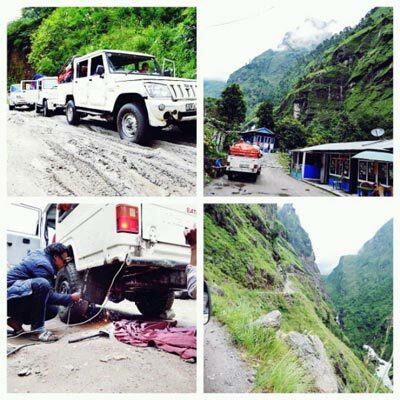 Photo Puwei L. Photo Puwei L.
29 September - Update from Kim N - Preparing to leave Manaslu Base Camp and an unforgettable experience. 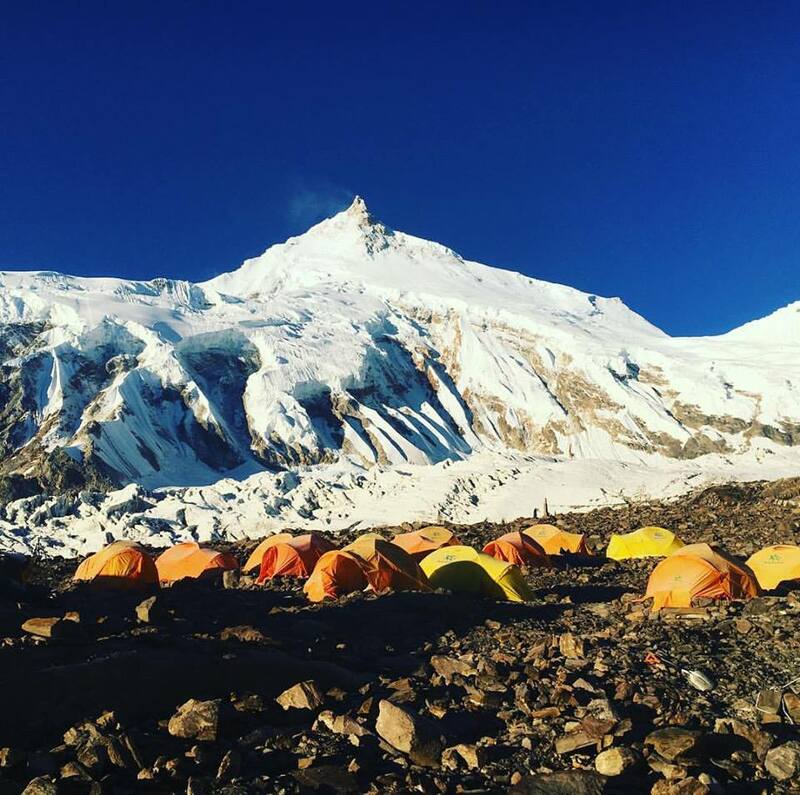 28 September - The team are still making thier way down to Camp 2, Camp one and basecamp. 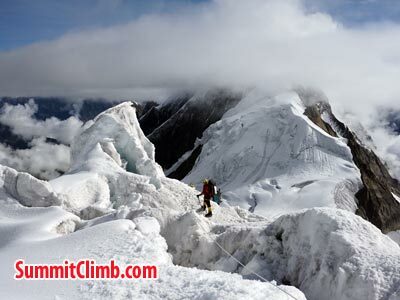 27 September - SummitClimb Manaslu Summit this morning and back to Camp4. Tomorrow back to Basecamp. 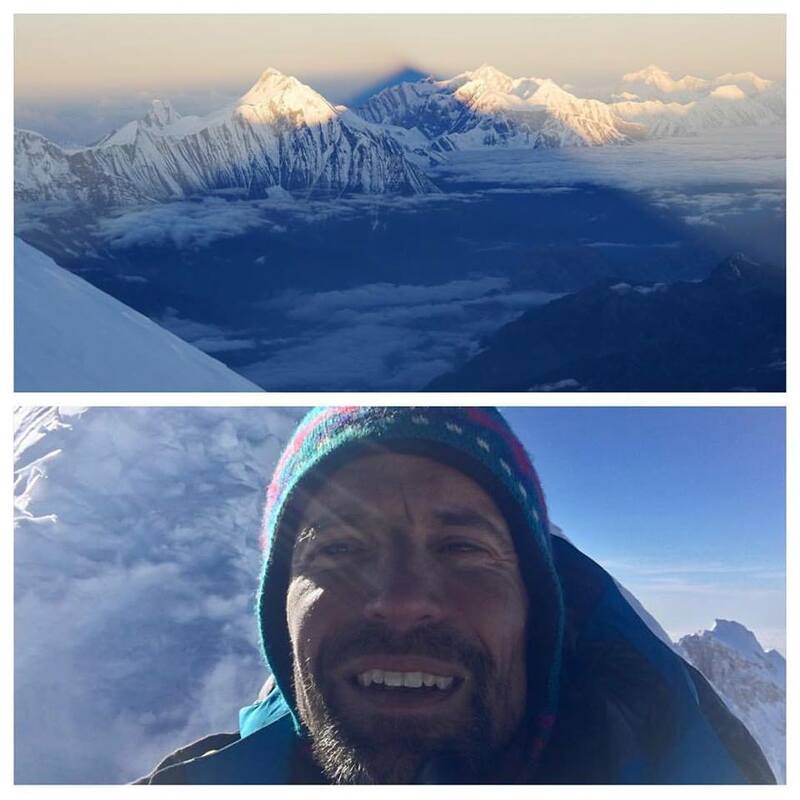 After the first rays of the sun have cast a mighty shadow by Manaslu on the Annapurna range, we have summit success by the whole team!. 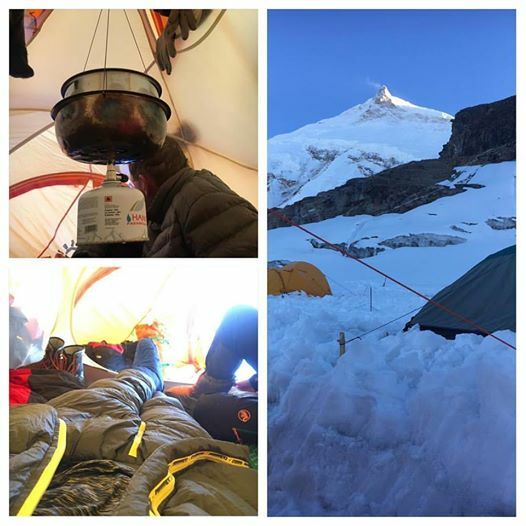 Photo Kim N.
Update from Kim N. - The team woke at midnight, made some quick drinks and set off for the summit. A long string of torches, slowly moving along, one step at a time. 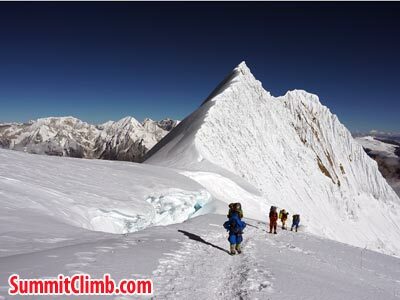 The weather was absolutely perfect - clear skies, no wind, temperature perhaps -10-15 deg C!n Finally the team reached the summit around 6:30am – well done to all members, leaders, Sherpas and support staff. Then they returned back down to C4. Had a drink and then off to C3. Ladders for crossing. Photo Eugene. On the way to summit. 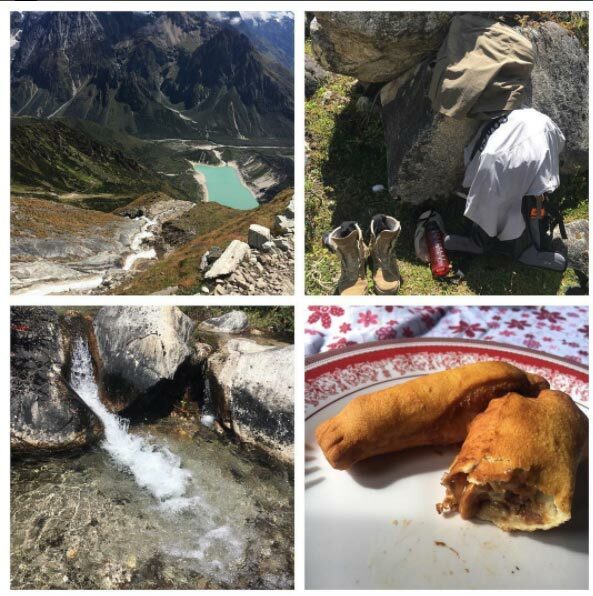 Photo Mangnus N.
26 September - Update from Kim N. - After a quick breakfast at Camp 3, down gear and snacks in the backpacks and the team headed off towards Camp 4, 7400m. 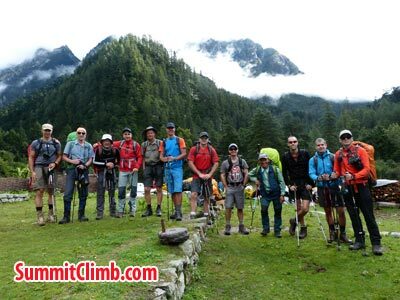 It was a long walk and the team arrived at Camp 4 after 8 hours. Now they can start thinking about the upcoming summit push that will begin at one in the morning! 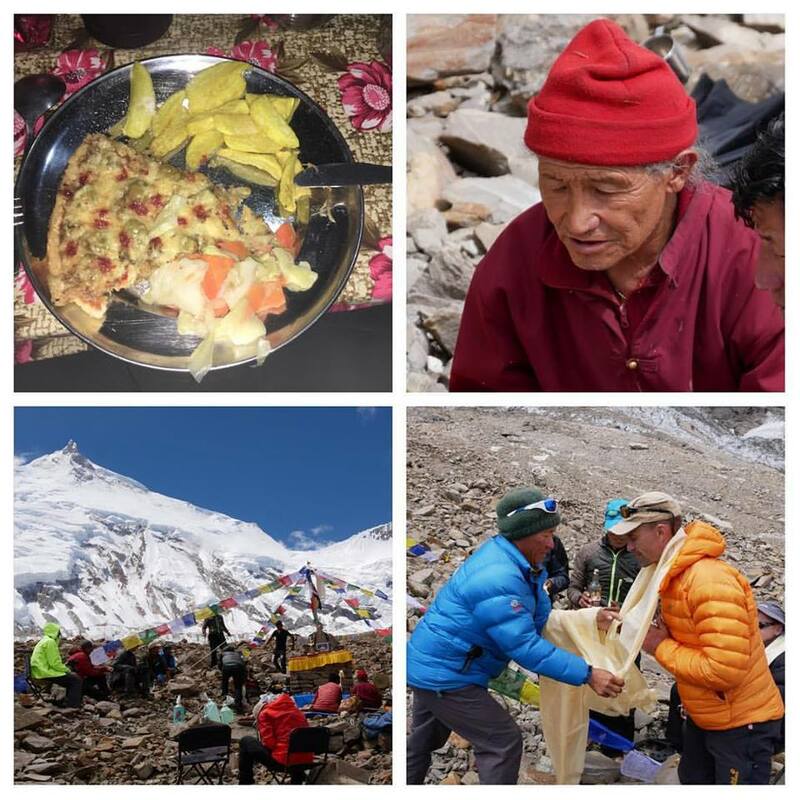 25 September - Update from Jangbu Sherpa - Now we are in Camp 2, all members eating their breakfast. 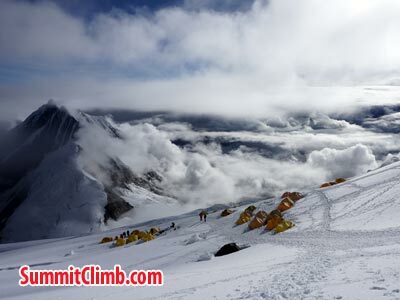 After breakfast we will go to camp 3 and then tomorrow we will move to Camp 4. 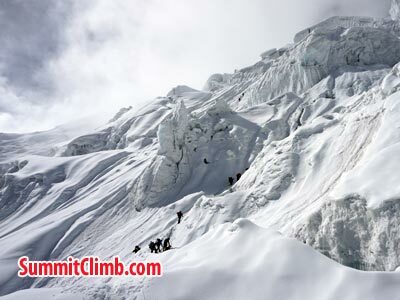 On 27th we will try for Summit. Wish us best of luck. 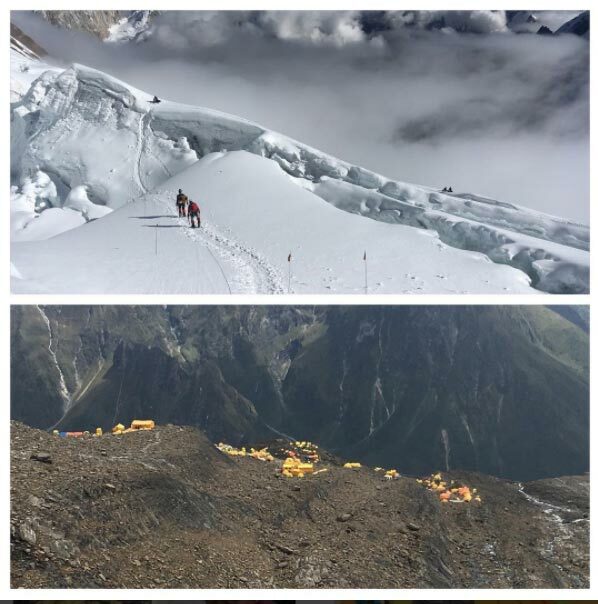 22 September - Update from Kim N - Just arrived in Camp 1, around noon. Tons of snow here as well as at least four times the number of tents! And I have yet to see the upper part of Camp 1. 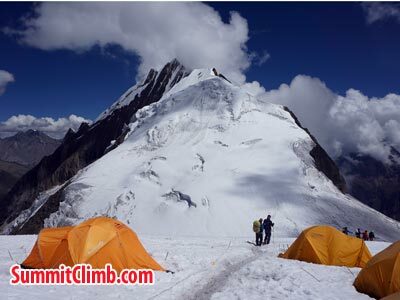 So, we will now spend the night here, and in the morning move on up to Camp 2. It is still snowing as it has been the whole way up, so we will need to take it easy and hope that somebody else will break trail before us. 21 September - Update from Kim N - Started raining around dinnertime yesterday. Rained throughout the night with a brief 1-2hr break around 3. So far the forecast has been accurate as it was supposed to start Wed afternoon, increase through Thu and then taper off. Rain down here and plenty of snow higher up. And now its been raining nonstop. 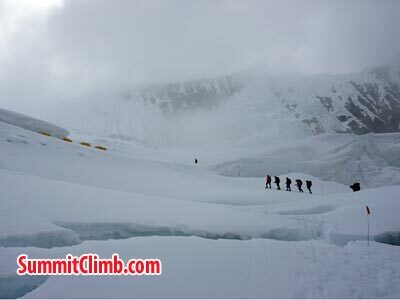 Just in camp 3 in bit bad weather. 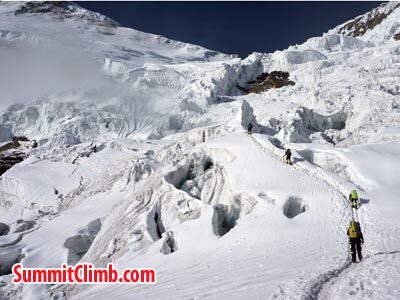 Photo Puwei L. Heading up to camp 3. 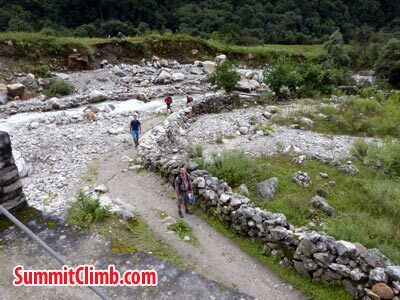 Photo Puwei L.
Tough climb to Camp 2. 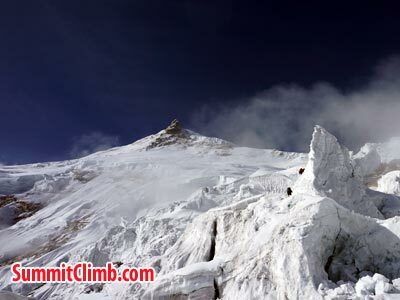 Two nights there including acclim climb to C3. Down to BC and a well deserved 3-5 days of rest. Photo Kim N.
20 September - Resting in Samagaon after rotation to camp 3. 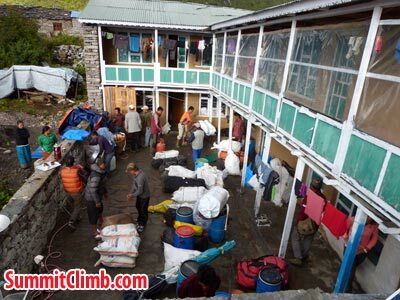 All the Sherpas just reach in Basecamp after delievery of group gear to Camp 3. 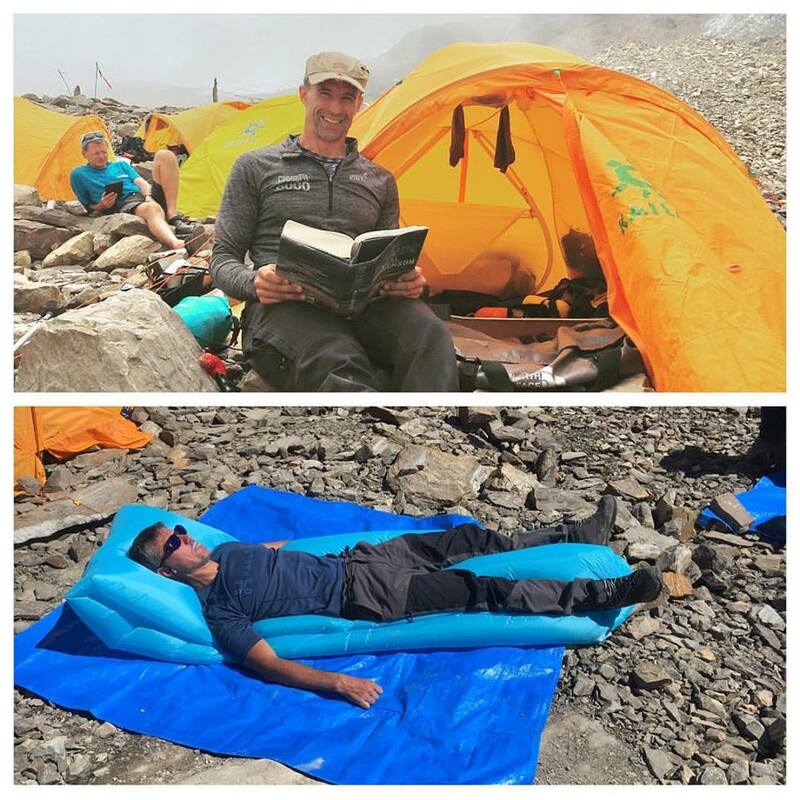 18 September - It is good time to up Shower Tent and relaxing in Basecamp. A rest day here is great and the program is clear - eat, rest and communicate with family and friends! But what is a rest day like on the mountain? Well, it depends on whether you are in base camp or not. In BC the facilities are better. This means kitchen with cook (i.e you are served three meals a day), dining tent, toilet tent, shower tent and best of all you typically have your own tent where you spread out your stuff however you please! Also at BC there is another huge benefit - the air is thicker. 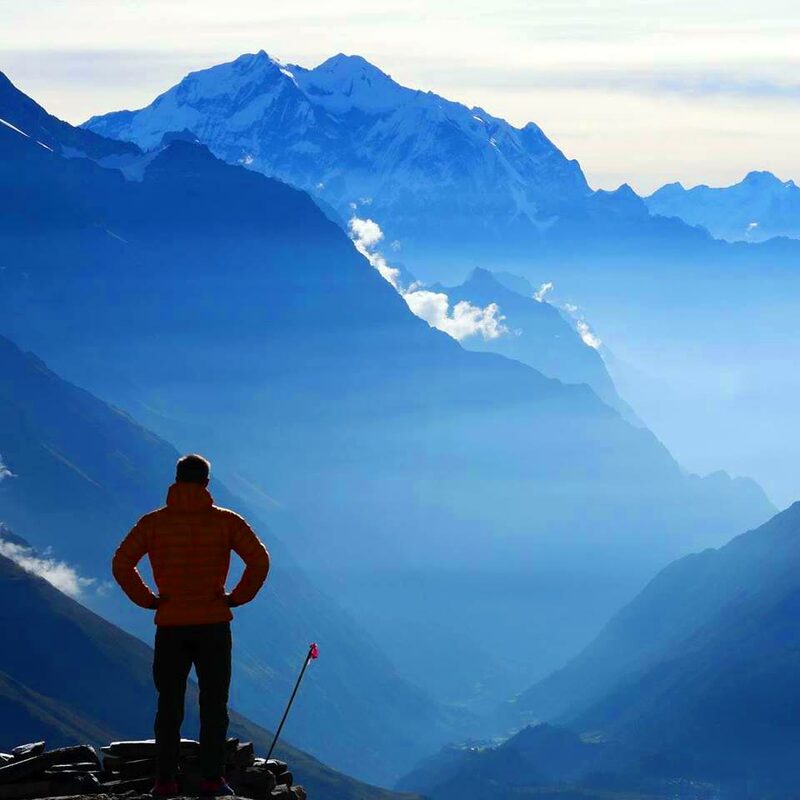 So your body can truly rest and work at adapting to higher altitudes. 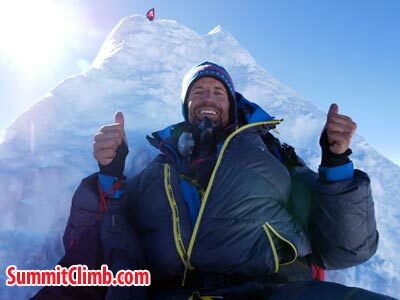 During a rest day at BC you read, eat, do laundry, shower, maintain your gear and of course sit and speculate about the upcoming climb. 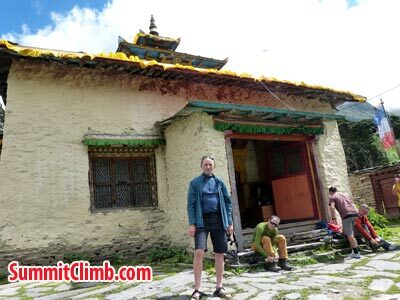 Quick trek down to Sama Gao, 3500m, with very refreshing cold dip on the way. Will spend 1-2 days here to eat fried snickers and recharge. 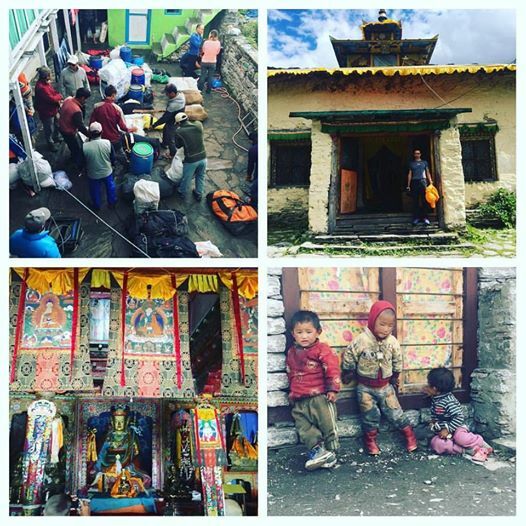 Photo Kim N.
17 September - Update from Jangbu Sherpa - Resting in Basecamp after rotation to camp 1 - camp 2 and camp 3. 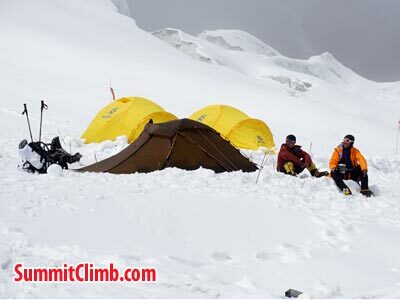 May be we will leave basecamp after 2-3 days for Camp 1 again. 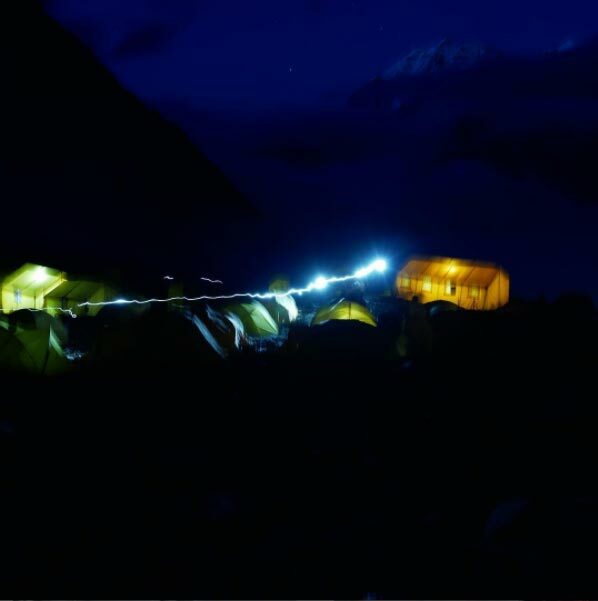 Our Manaslu base camp at night. 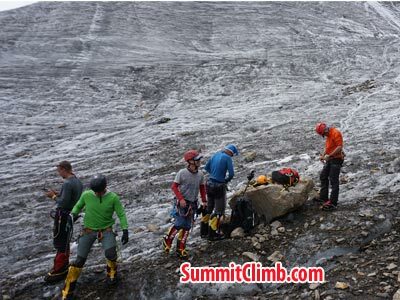 Photo : Kim N.
14 September - We are all now at Camp 2. 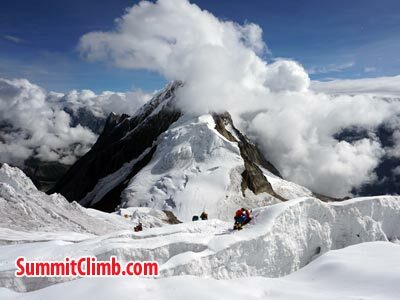 If weather is good we will heading up to camp 3. 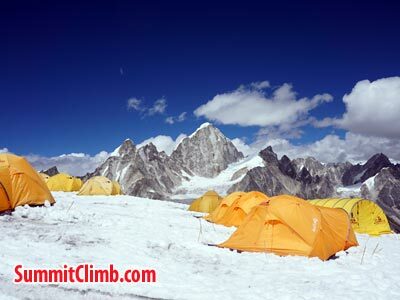 Back in Base Camp 5000m. 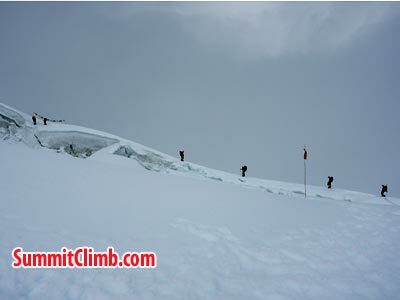 3hs down from Camp 2 6400m. Wonderful hot shower and clean clothes. 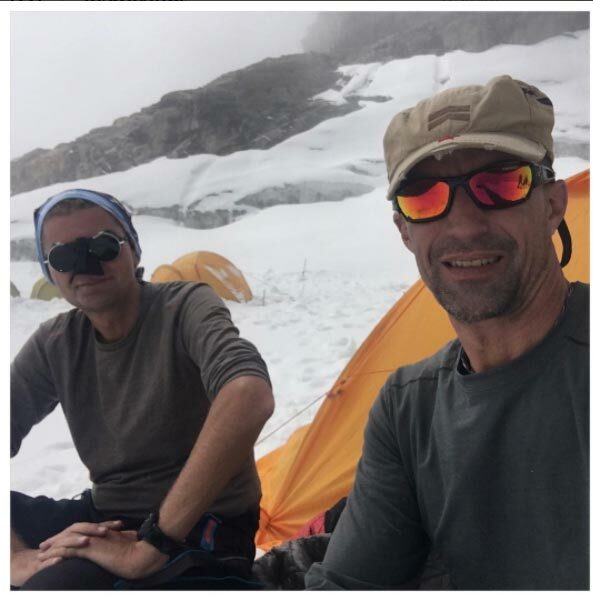 13 September - Still at Camp 1 on a beautiful but excruciatingly hot day. Too hot outside and way too hot inside the tent. Just trying to relax, drink a lot, and relax. May be a very long day ahead tomorrow to Camp 2!. 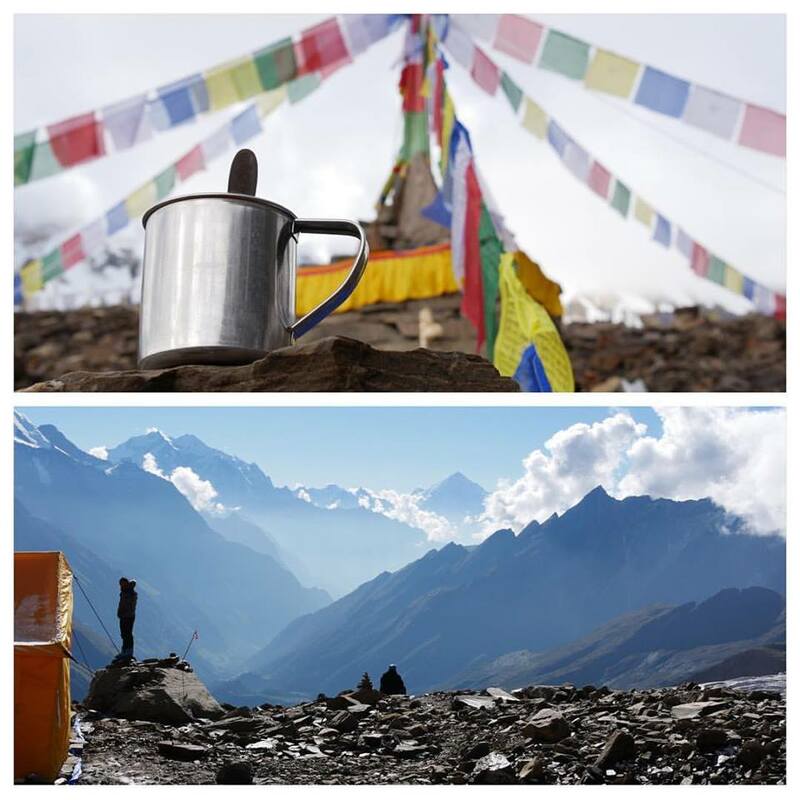 12 September - Update from Kim - After 5 days of Base Camp life, Greetings from Camp 1, 5500m! We had a good 3h trek up here over a pretty broken up glacier. Temperature ok but otherwise foggy. Now in the evening as we are cooking dinner, mixed chicken+mushroom soup and and some delicious beef stroganoff, the weather has cleared up and once more the view is amazing. As usual plans change. Our new plan is now to stay here for two nights and then, conditions permitting, make our way towards Camp 2 and perhaps even spend a night there. After that 2-3 days of rest at base camp. 11 September - Update from Kim - Had a pretty good night's sleep after a delicious serving of pizza and french fries last night. Quick hike up to the glacier. Then long Puja ceremony where we were blessed by a small wrinkled holy #lama. 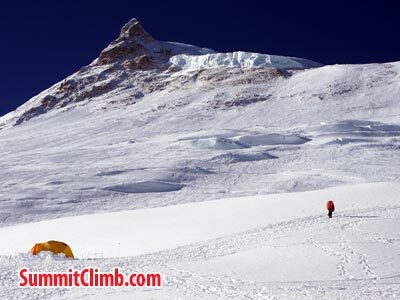 Tomorrow Camp 1, overnight, and perhaps short climb towards Camp 2, back to Base Camp. 10 September - All is wel,l perfect weather. Ice training time. 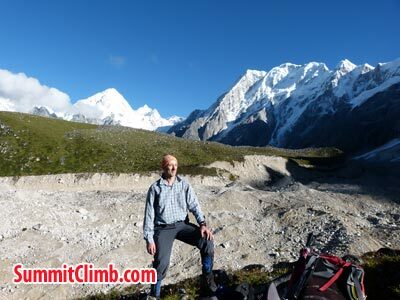 9 September - Base Camp, 5000 meters / foot , relaxing today, weather perfect! 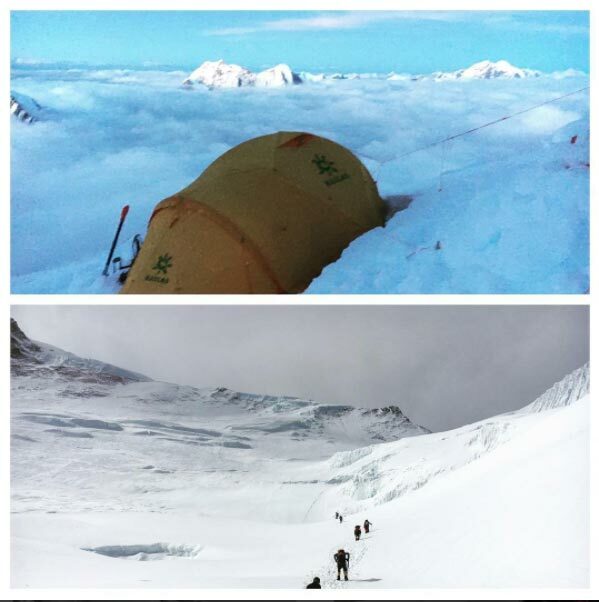 Update from KIM - A day at base camp. Got up very early, before 6, to watch the first rays of sunshine creep up over the mountain range in the East and hit Manaslu. An incredible sight! 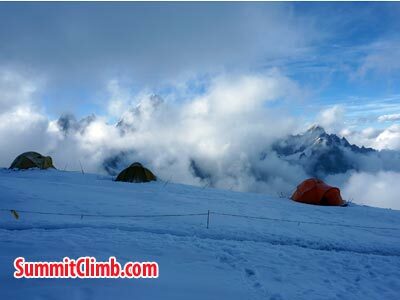 8 September - All member's are now at BC 5000mtr higher than normal BC Due to pitching camp higher up the mountain. All members are doing a great job ! Tea house at Samagaon. Photo Eugene V. Samagaon monastry. 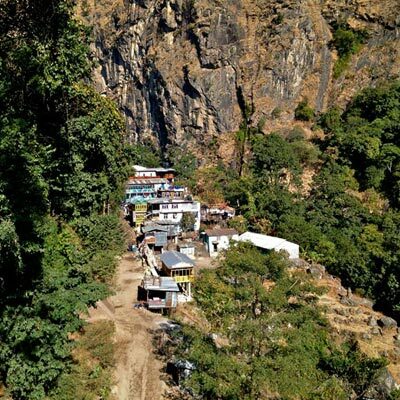 Photo Eugene V.
6 September - We hiked from Samdo to samagaon short pleasant day day mostly down hill. Monastry at Samagaon. Photo Eugene V. Eugene and Lama. 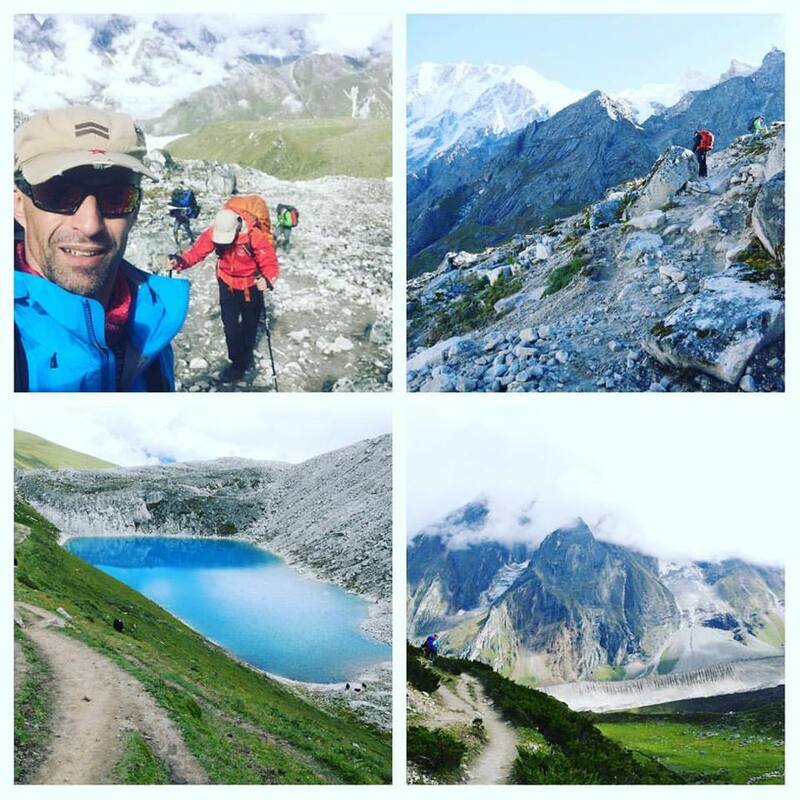 Photo Eugene V.
5 September - Yesterday extreme trek up 1500m to 5200m and down, 10+ hours. Overnight in small Samdo. 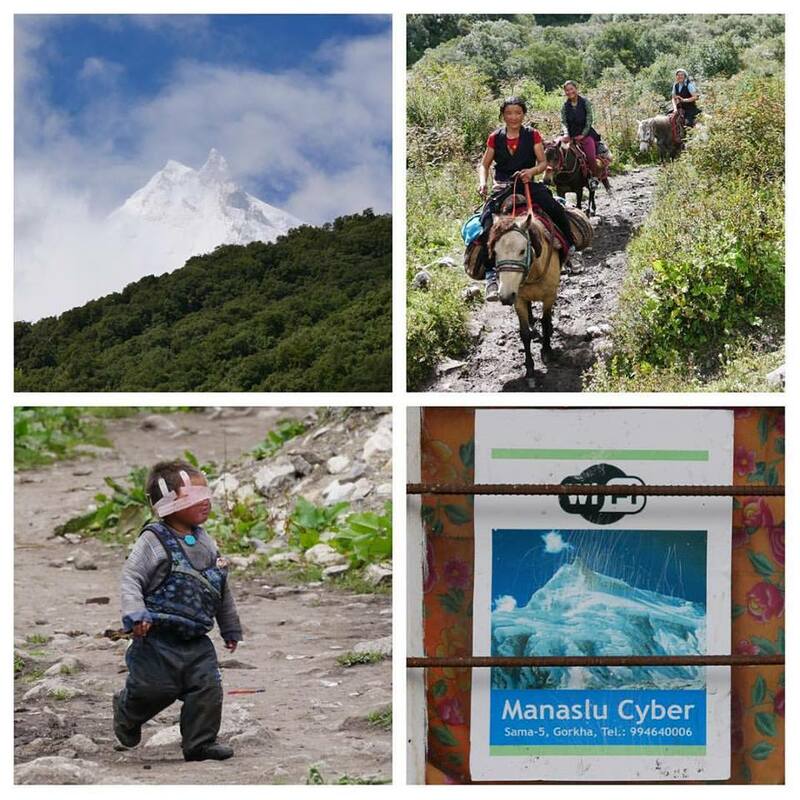 4 September - Today we did an acclimatisation hike up to 4000m the clouds cleared and we got some spectacular views. 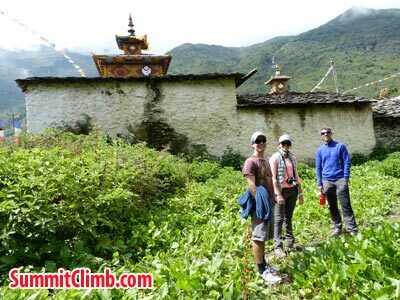 We hiked from Dharamsala to Samdo all members doing well. All members are in good spirits despite the intermittent rain, the path is very muddy but easily navigated, Beautiful scenery all around. 31 Aug - After 8 - 13 hrs drive we are now at basishar all mebers are well.